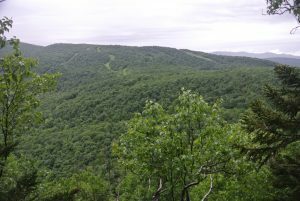 One of the more popular “mini-hikes” in the area is the short jaunt from the top of Middlebury Gap (Rt. 125) to the viewpoint known as Silent Cliffs, which provides a great view of the College Snow Bowl, and on clear days, broader vistas to the south and east. Since I know from past experience that a lot of the hits on this blog are by people looking for hiking trails, if you want to see the short “normal way” to get to this nice little vista, I will describe it in a short paragraph at the end of this posting. Needless to say, I didn’t go that way on this run. It was a gloomy looking Saturday morning and I was looking for my first truly “mountainy” run of the season. I had recently heard from a friend that the Burnt Hill Trail, which I had not hiked in over 20 years, made for a good means of ascending to the Long Trail, with a pitch and footing generally amenable to trail running. While the usual trailhead for this is a small turnout off of FS 59, the road which passes through the Breadloaf campus, I decided to park at the campus itself to add a little more mileage to my run. This also ensured that if I made a “loop run” out of this route, I would not have the climb back up to my car at the finish line. Despite a few passing showers earlier in the morning, I drove up to Breadloaf and parked in the nearly-empty parking lot to being my run. I was surprised by how deserted the place was, as I knew the mountain campus had been used in the past for housing alums returning for reunions, but I guess they are now all crammed into dorm, just like in the good old days! 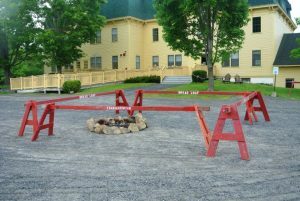 I was amused, however, by the remnants of a fire ring set up in the parking lot. I can only guess that the lawyers must have warned the college about the dangers of mixing intoxicated 50-somethings and fire, as the fire pit was ringed by barriers to keep these happy kids from getting hurt! I started my actual run on some of the trails in the “Battell Loop” section of the Rikert Ski Touring Area, the section of woods just east across the field, and wound my way up the Freeman Trail until I reached FS 59 by Gilmore House, where I crossed over and followed the Gilmore Trail until I got to FS 59 again, this time higher up and by the area where most people park for the Burnt Hill Trail. There is a detailed map of the Rikert Trails on one of the links to the right of this blog ( ——> thataway for the directionaly challenged) for those who don’t know the trails. Reaching the road, and short few yards to the right brought me to the beginnings of the combined Burnt Hill Trail and Norske Trail, which run together in their current incarnation (they were once totally separate trails) for the next .7 miles. 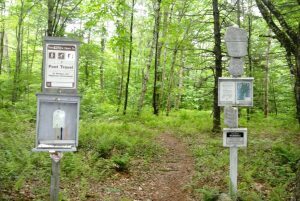 Once the trails diverge, the Burnt Hill Trail brings hikers all the way to the top of the Green Mt Ridge, while the Norske Trail, which is designed for skiing (and was featured in this blog a few years ago) brings one up to the tight corner on Rt 125 just past the Snow Bowl. The climbing here is pretty gentle, and the trail is well-traveled making for a pretty easy ascent at this point. A little deeper into the forest, I came to a sign post announcing the boundary line between mere national forest, and the Breadloaf Wilderness. I stood on one side of the line, then the other, and didn’t notice a difference! I guess it is kind of comforting that I live in an area where, even with a well-trained eye, I couldn’t tell the difference between mere forest, and official wilderness. 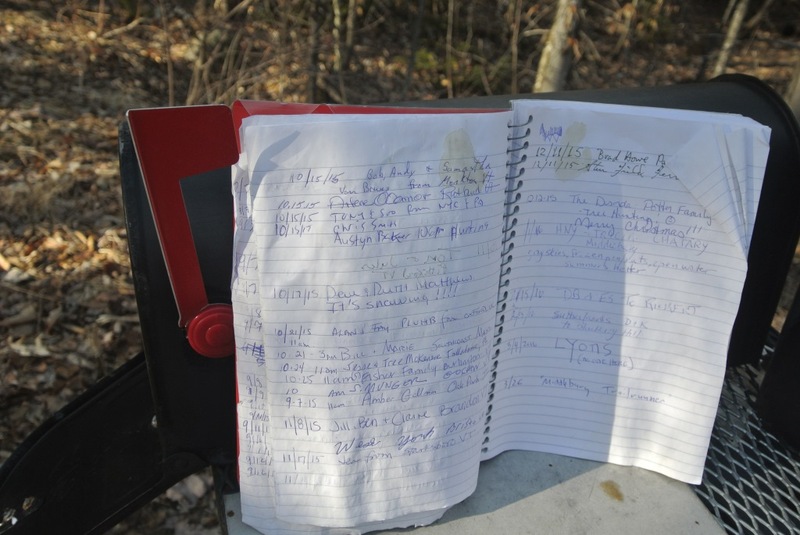 I also saw the trail log in, and dutifully inscribed my name and destination, using my blogging pseudonym of course. This was your standard trail use kiosk, lacking the “you’ve got mail” vibe of the sign-in I saw a few weeks ago on another run. The trail at this point mostly wound its way through mixed forest, and the canopy kept me relatively dry despite the steady drizzle which had developed. 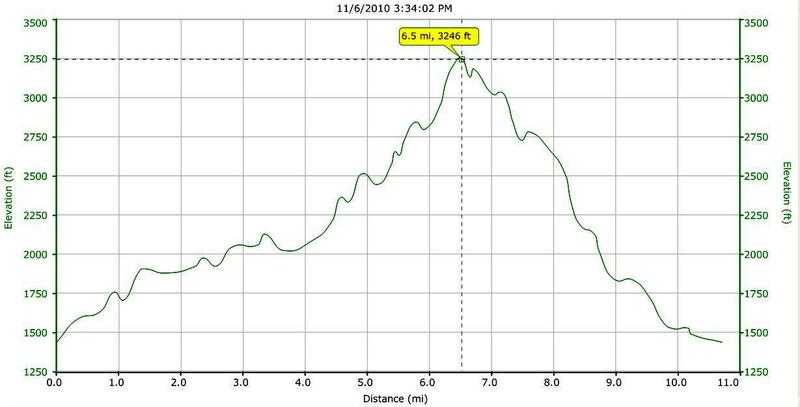 Finally, after about a mile and a half on the Burnt Hill Trail (or 2.5 miles from the start of the run) the trail got a little too steep and rocky for consistent uphill running, so the next half mile or so was mostly just fast hiking. At about the 3 mile mark, I noticed that the sky was in front of me, instead of just overhead, signifying that I was near the top of the ridge, and sure enough, in a few moments I was at the Long Trail. A lot of the Long Trail is very rocky and rooty, as befitting a heavily used ridge line trail, but I was pleasantly surprised to discover that this section, going right (south) all the rest of the way to the top of 125 was actually very nice for running, at least by challenging Long Trail standards. There were a few noteworthy sights along this heavily wooded stretch of ridgeline hovering at around the 3000 ft elevation line. One of these sights was an omission – it has been so long that I have been on this section that I was unaware of the removal of the Boyce Mt Shelter, but when I came to a small clearing and did a little googling, I realized this was the case. I also discovered another, more puzzling mystery. 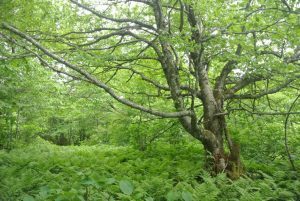 I came across another patch along the ridge where there was an opening in the generally dense leaf canopy, and I saw the surprise – there was a small grove of apple trees! It was not surprising that apple trees could grow up there, as they are an exceptionally hardy tree in northern climates, but apple trees almost always serve as an excellent marker of past human habitation, as they don’t really exist in the wild, only where deliberately planted. Now the mystery is, who planted them up there? I can’t believe that someone actually lived and farmed at this altitude, and in fact have seen maps of olde Ripton, and can’t remember seeing any mention of a homestead on the ridge. But somebody took the time to clear land, and plant a few of these trees, now ancient, but why? Passing this by, I skipped and hopped along the trail for a few miles until I came to a T in the road, and realized I had finally come to the trail spur to the primary destination for this run. A right turn would take me to the top of Rt 125 in about a third of a mile, while a left turn would bring me to the Silent Cliffs, so I took the left, and after winding through the forest for about a third of a mile, came to the outcropping with its views. One of the first things I noticed was that the Silent Cliffs was by far the noisiest place I had been on the run. The traffic below on Rt 125, compounded by the loose rock from the construction made it very obvious that civilization was not far away. The view, dominated by Worth Mt. and the Snow Bowl was as nice as I remembered, however, although a little limited by the clouds and increasingly heavy rain. I returned to the “T” in the trail, this time going straight, and in a few short minutes I reached the top of Middlebury Gap. At this point, I could have elected to simply take the road back to my car at Breadloaf, but electing to maximize my time on the trails, I crossed over the short stretch of the Long Trail, continuing south until I reached the top of the Sheehan Chair, and ran down the service road on the Voter trail to the Snow Bowl parking lot, and rejoined Rt 125 for about a mile. Finally, I hopped into the woods on the Rikert Trails when I came to the Catamount Trail marker on the right, and came out into the Rikert field, finishing off a 9 mile run at my car, as the rain continued to soak me as I ran in the open. While the distance in this run wasn’t that long, the nature of the running was a lot more challenging than most of my runs. The total climb from Breadloaf to the top of the ridge was 1600 ft, and the trails are considerably rougher than the much tamer TAM around town. This run took me over 2 hours, so my per mile pace was much slower than it is on the trails nearer to town. It is very hard for even seasoned trail runners to average much faster than 15 min/mile on this sort of mountainous terrain, even with some easier road sections averaged in. 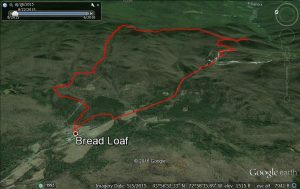 Google Earth of the run, looking west. INSTRUCTIONS TO GET TO SILENT CLIFFS THE NORMAL WAY: Drive to the top of the Middlebury Gap. 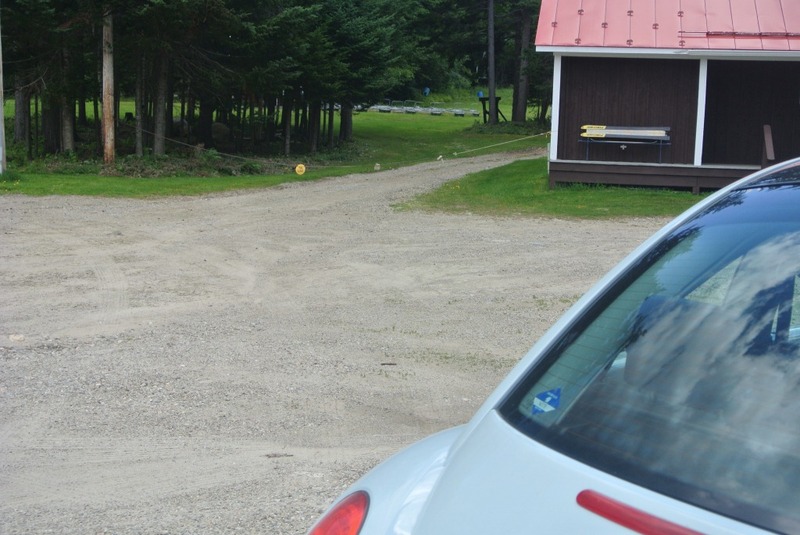 Park your car or bicycle, and head north on the Long Trail. This is the trail on the opposite side of the road from the parking lot. After about 1/3 of a mile of steady ascent (a few hundred feet altitude gain), you will get to the fork on the trail. Take the right (actually straight ahead) trail. This is very well marked by trail signs at this point. After about another 1/3 of a mile of gently descending and climbing trail taking you to the cliff overlook. Sit down, enjoy, and return as needed! 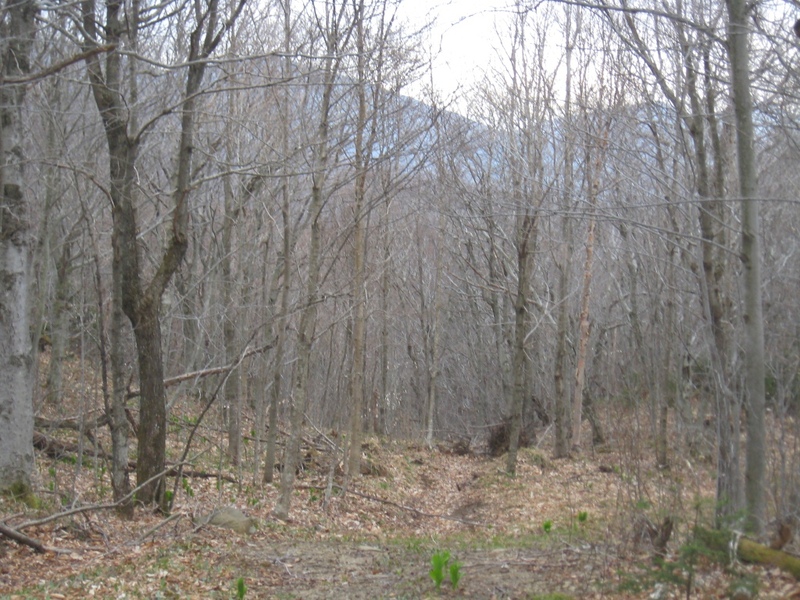 This entry was posted in Midd Blogosphere and tagged Apple Trees, Breadloaf, Burnt Hill Trail, Hill Climb, Long Trail, Middlebury College Snow Bowl, Running, Silent Cliffs, Worth Mountain on June 12, 2016 by Jeff. For direct, easily accessible mountain runs, ski areas are hard to beat. While most of the ski trails are far to steep to run, almost all ski areas offer one easier route down the mountain. In part, trails of this sort can be motivational for less skilled skiers, giving them a chance to experience the top of the mountain, and see the sort of trails they might aspire to. More practically, they offer a drivable route to the summit, at least with 4WD vehicles, allowing for access and maintenance during the summer months. At the Middlebury College Snow Bowl, the trail that fits this description is the Voter Trail. I described a run up this trail a few years ago, hoping to describe a run to the top of Worth Mountain, whose summit is slightly south of the top of the Snow Bowl. Alas, I turned around too soon, as I discovered when I loaded my GPS track into Google Earth – the point where I turned around was actually a false peak, slightly to the north of the true peak. It was time to rectify this mistake! I pulled into the Snow Bowl Parking lot on a pleasant, cool Sunday afternoon, and saw a lot of construction going on. 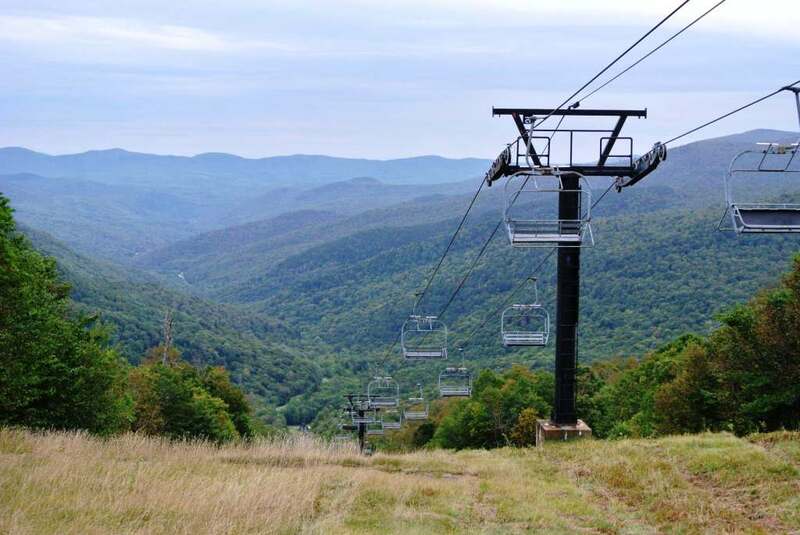 There were huge piles of fill up near the exit, presumable for the ongoing road improvement on Rt 125, and a substantial stack of rusty pipes – from the look of things, they are in the process of replacing some of the plumbing required for snowmaking this summer. I also found it curious, that with all this open terrain in front of me, there was a random “trail closed” sign hanging in front of the entrance to the Voter trail, to the left of the Ski Patrol Hut. I assumed, of course, that this was there to deter motor vehicles, rather than runners. Stepping over the sign, I began the day’s ascent. While I have been on this trail a few times in the summer, noting the broken up asphalt beneath my feet that somebody went to the bother of actually paving the first part of this trail – I have never noticed this on any of the ski area service roads I have run before. The ascent via the Voter trail is not as easy as one might assume for a “green circle” trail. Things are a lot steeper running up than they are skiing down! I could maintain a running gait for most of the ascent, with only a few short walking sections due to poor footing and increased steepness in a few pitches. Running at the pace of “1.0 Jeffs” (whatever speed I am running at the time corresponds to 1.0 Jeffs) I got to the top of the Bowl in about 20 min. Of course, I had to take the obligatory picture of the views to the east – these constitute the best views on the day’s run! From here, I chose to continue uphill to reach the true summit of Worth Mountain, by continuing south on the Long Trail. In my previously described run, I assumed, incorrectly, that the first summit was indeed the summit of Worth. As it turns out, I learned the hard way after my previous run that I had a little further to go – so remember – THE FIRST SUMMIT IS NOT THE SUMMIT! THE SECOND SUMMIT IS! Oh – and did I mention that neither of them has any decent views? The trail run itself isn’t bad, however – most of the Long Trail is very “scrambly” and this section, with its modest ascents and descents is actually run-worthy in places, albeit slowly and with careful attention to one’s footfalls. 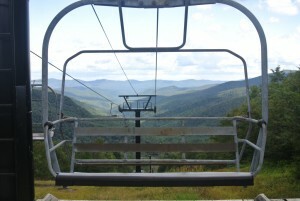 reaching the summit, I retraced my steps back to the top of the Bailey Falls chairlift, and continued down Voter, at least part way. I had another goal for this run, however, so rather than simply retrace my steps to my car, when I reached the Meredith Trail, the first gentle trail to the right, about half way down the mountain, I saw a set of recent 4WD tracks, which had beaten down the increasingly dense and high ground cover, and used them for my descent. I have known about the existence of a waterfall, known, not surprisingly, as Bailey Falls” (hence the name of the Bailey Falls Chair lift!) for several years, but had never actually seen them, nor have I met anyone who has, either! 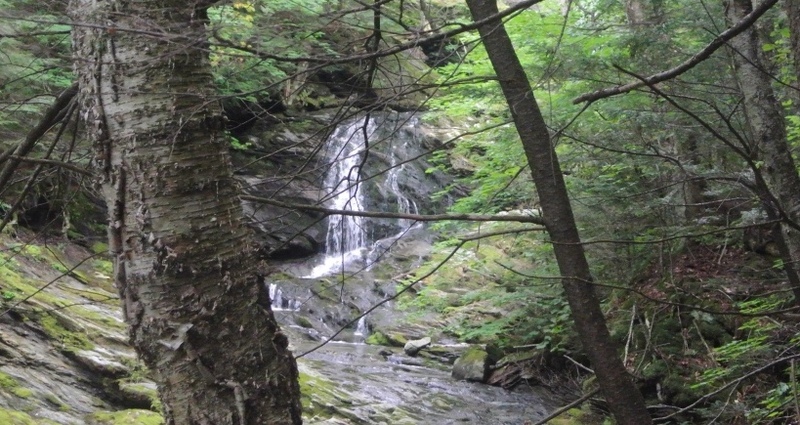 According to the scant descriptions online, this waterfall is kind of hidden in plain sight – it is probably 100 yards from the Youngman Trail at the Snow Bowl, and maybe a quarter mile from the small parking lot along the east side of Rt 125, across from the Bailey ski lift. I followed one of the online descriptions of how to find this hidden gem, heading uphill from the chair lift for 30-40 yards before bushwhacking into the woods, but within a few moments I could see it, quite obviously, a 100 yards or so upstream. The challenge was getting to it, as the hillside where I was standing was rather steep, and did not provide for firm footing. Hanging onto appropriately spaced trees, I was able to lower myself to the point where I could catch a picture of it, although the picture does not do the falls justice. 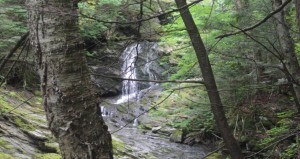 This shot is of only the lowest 1/3 of the falls – I could catch glimpses of higher cascades through the trees. I will need to return, trying to get at it from the other side of the stream, where access appeared easier, to get a fuller glimpse of this rarely seen treasure. I have a hunch it is about as high as the well known Falls of Lana, and certainly dwarfs the well known Texas Falls roadside attraction. Now, only a short section of running remained – the climb back up, and over to the east side of Middlebury Gap where my car awaited me. I could have chosen to move to the road at this point, given the wooden bridge which allowed for passage over bogs and streams from the bottom or the Bailey Falls lift to Rt. 125, but chose instead to run up the trail, furthermost to my right looking uphill, the Wissler Trail, named after a legendary and long-deceased Middlebury College Physics professor Ben Wissler. 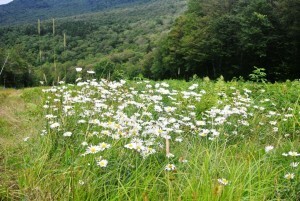 After a few minutes of chugging up this grassy slope on my tiring legs, I reached the top of the Sheehan Chair, where I was pleasantly surprised by a large clump of daisies on the Lang Trail. The daisies seem to be starting to wither down in the valley, but apparently this patch in the cooler higher altitude climes is doing quite well. From this point, a short descent on the service road following the Lang Trail, which is after all the bunny slope of the Snow Bowl, led me back to my car for a challenging but scenic and interesting 5.5 mile run, with about 1800 feet total of climbing and descents. 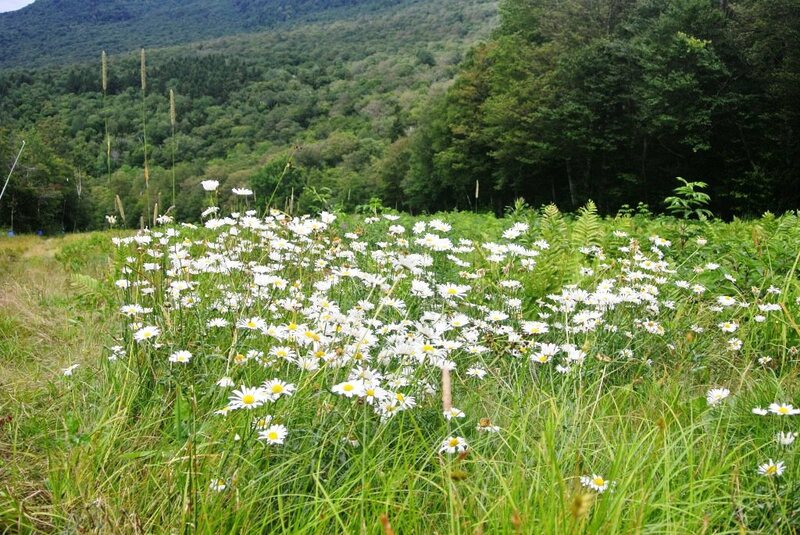 This entry was posted in Midd Blogosphere and tagged Bailey Falls, daisies, Hill Climb, Middlebury College Snow Bowl, Running, Worth Mountain on August 9, 2015 by Jeff. On this, the last weekend before the start of my school year, I was looking for a good long run to complete the summer running season. August had been a disappointing month for running, due to back spasms which slowed me for most of the nicest days of the summer, but after a month of recovery, I felt up to a longer run than I had done in a while. With that in mind, I thought it would be fun to revisit a route which I last ran (and blogged) three years ago under very different conditions, and entitled it “Stick Season above the Snow Line” This loop involves considerable time on the Long Trail along the Worth Mountain ridge, and when I last checked it out I was running through a bit of snow, and racing to get back to my car before darkness. While snow at the higher altitudes may not be that far off, this was most definitely a late summer run – the leaves are still all there, and mostly green, at least to this somewhat colorblind runner. Cooler temperatures also made for pleasant conditions on a cloudy September afternoon. 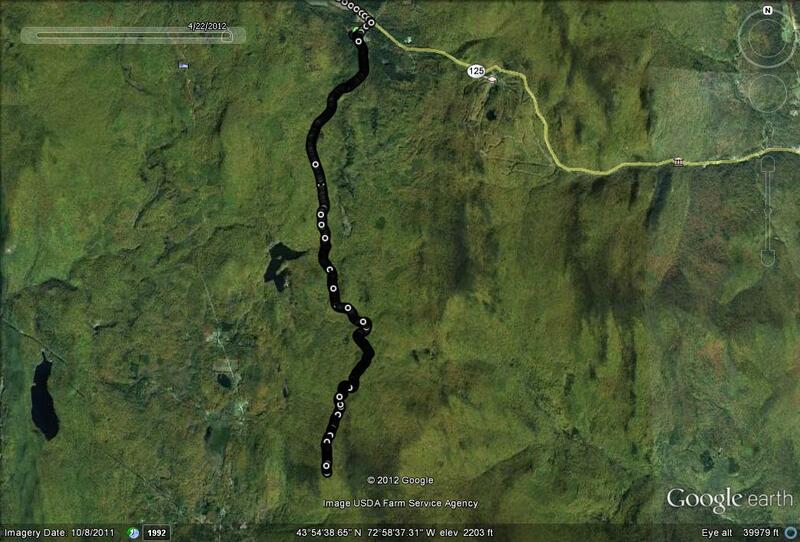 This loop is also of a length, and on terrain which most people would call “a hike”. While I love a long hike in the mountains, one of the great pleasures of trailrunning is that it can get you out in the woods covering a lot of terrain when you don’t have time for the more leisurely pacing of a day hike. So, before this run, I mowed the lawn, played the piano for a bit, read a few papers, and enjoyed a leisurely late lunch before setting off, and still got back in plenty of time for dinner. 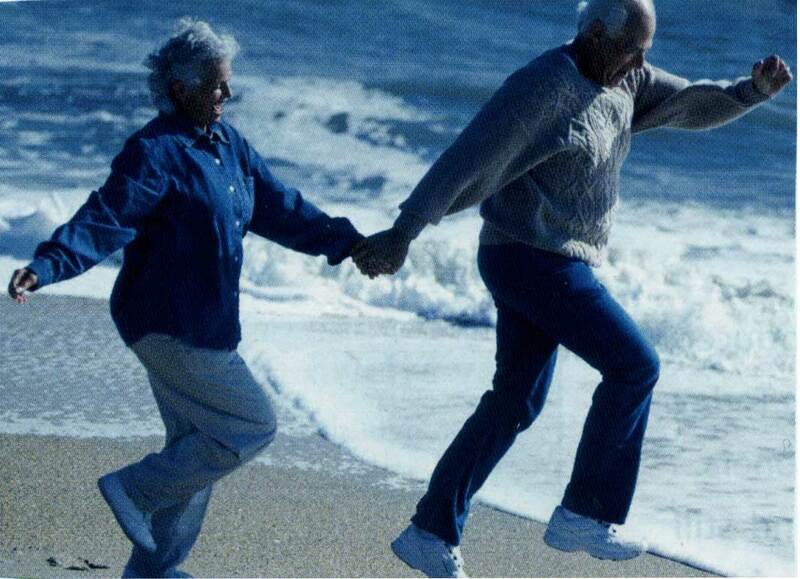 Live life to the fullest! Setting off from my favorite running trailhead, the Brooks Road Trailhead (also known as the Chatfield Trailhead), located off of a short dirt road a mile or so below the Middlebury College Snow Bowl, I started up the comfortable climb on the dirt road. While this road is open to car traffic, I rarely see any motor vehicles on it. The road climbs steeply for the first mile and a half, rising about 400-500 feet rather abruptly, but climbs more gently most of the rest of the way to its end, 3.7 miles up into the mountains. When you get to the end of the road, follow the well worn path over the obvious footbridge over Sucker Brook, until you reach the Long Trail Spur trail on your left. 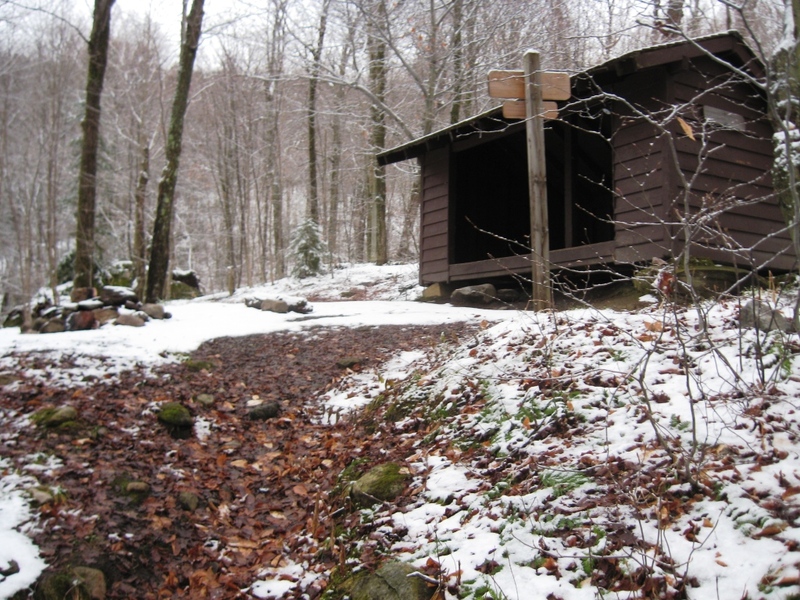 Take this trail, which also climbs pretty gradually with a lot of easy running terrain for another mile or so, until you reach the Sucker Brook Shelter, found in a saddle in the Green Mountains known as “Romance Gap”. I met a small group of hikers, one of whom was a Long Trail through-hiker, and after exchanging pleasantries for a few minutes, headed up the hillside, and joined the Long Trail itself in a few minutes, turned left, and headed north towards Middlebury Gap. As expected, the running on the Long Trail was more technical than the rest of the run. As mountain ridge trails go, this was more runnable than most, with long sections of gradually climbing and descending dirt or mud path to run on. In the rockier sections, the running becomes more akin to skipping, with your feet doing all kinds of crazy things in order to maintain a decent speed! In sections where the climbing or descending got steeper, or potentially more slippery, I slowed to a fast hiking speed. This section of the Long Trail is not known for its sweeping vistas, although there were a few limited views through the trees in places. What I do love about this section are the more subtle sights one comes across when traipsing through the forest at around 3000 ft elevation. 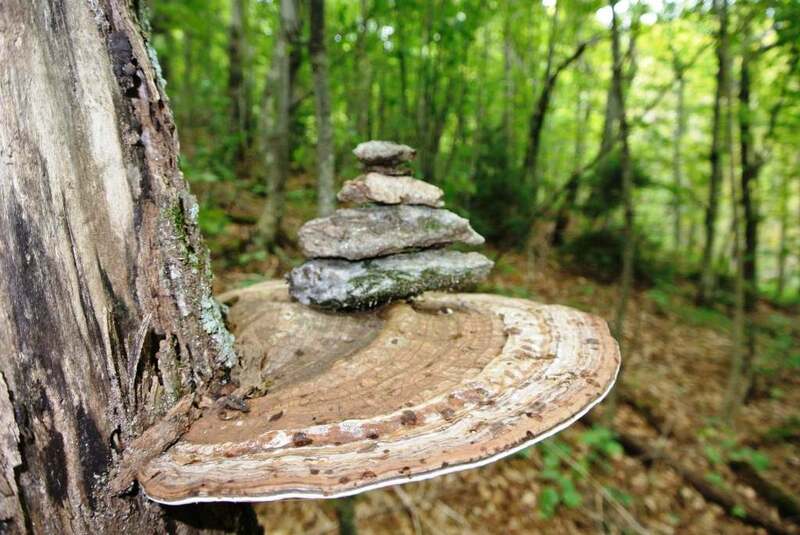 I have always been particularly fond of the shelf fungus growing out of the side of some of the older hardwoods, and one which I came across looked so sturdy that it was begging for something to display. So, I set up a small rock cairn on it, which will no doubt puzzle or amuse subsequent passersby if they have the presence of mind to look beyond their own boots or running shoes. Not long after this, I reached the high point of the run, the summit of Worth Mountain (~3200 ft) and began the gradual undulating descent to the top of the Snow Bowl. I was amused to meet a hiker, who seemed so happy to get a signal on his cell phone that he couldn’t resist the temptation to check his facebook page. To each his own…. 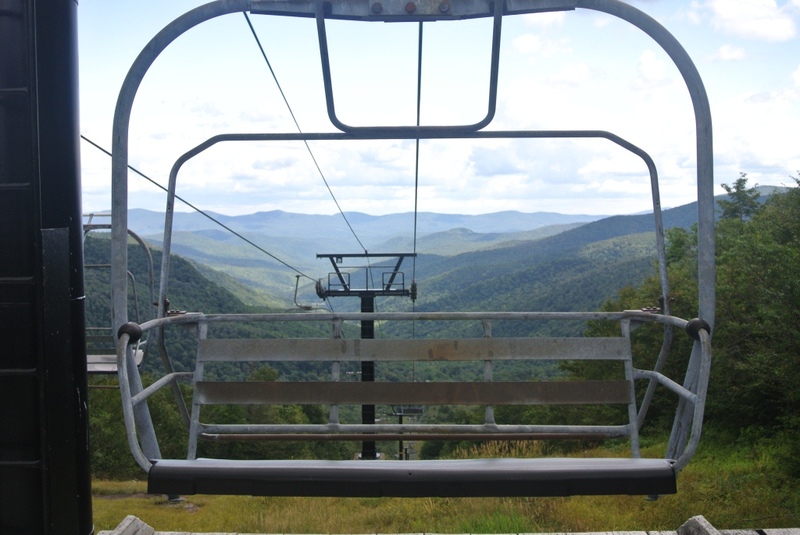 The wooden walkways signaled my approach to the Snow Bowl, and shortly thereafter, I broke out into the amazing view towards the east from the top of the Bailey Falls lift. 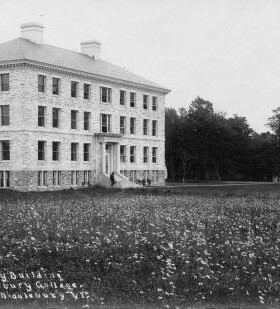 From here, I scrambled down the steeper upper sections of the Voter Trail at the Snow Bowl, named after Old Professor Perley Voter, one of my predecessors in the Chemistry Department at the college. He must have been great, as there is also a building named after him, Voter Hall! As I reached the bottom, I passed a fellow middle-aged trail runner on his way up the mountain, and after the mandatory exchange of complaints about our aging bodies, headed across the parking lot, and descended on Rt 125 to return to my car just as the drizzling rain started to get just a little bit heavier. According to my GPS, this was a 10.5 mile run, with an 1800 foot ascent, probably closer to 2000 feet with the undulations along the way. Not a bad way to end the summer. Now, time to prepare for Monday classes……And bring on the Fall! 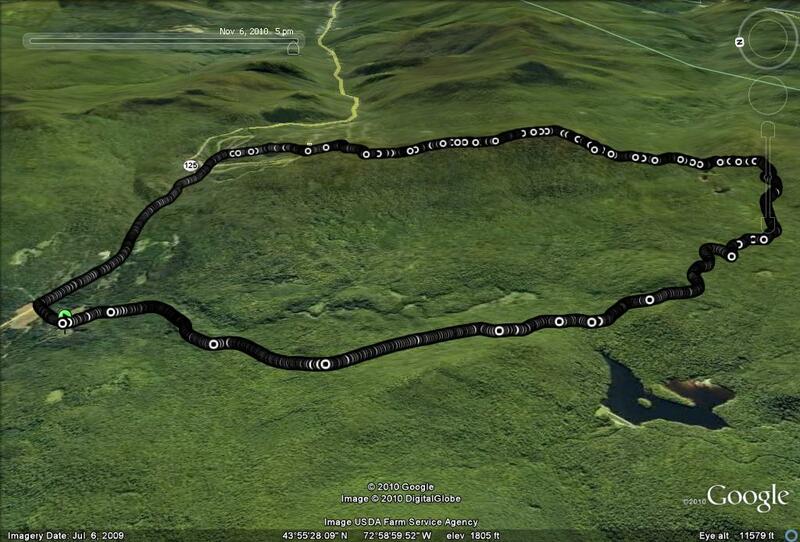 This entry was posted in Midd Blogosphere and tagged Brooks Road trailhead, Hill Climb, Long Trail, Middlebury College Snow Bowl, mud, Ripton, Running, Worth Mountain on September 8, 2013 by Jeff. 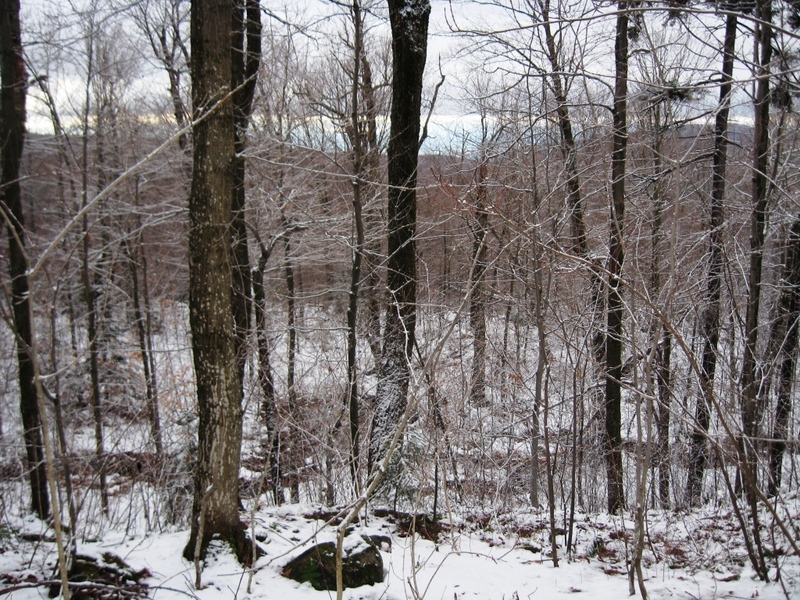 In one of my winter posts a few years ago, I described a great ski route at the Blueberry Hill Ski Touring Area in Goshen, on the trail traversing the high flanks of Romance Mountain. 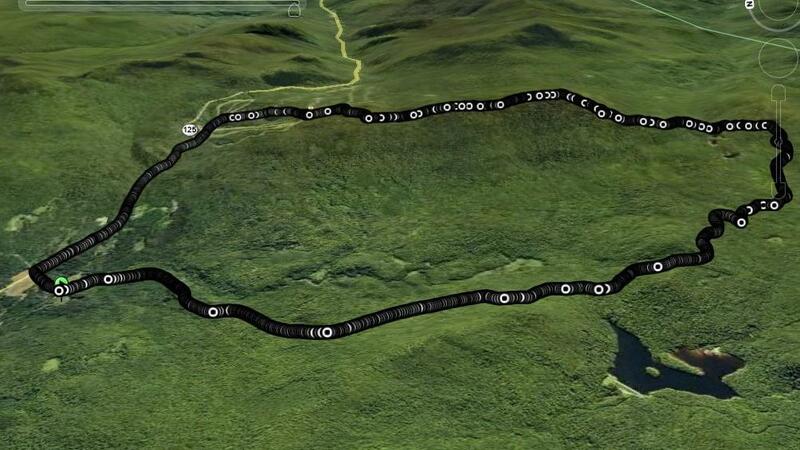 It has been claimed that this trail is “the highest altitude groomed cross country ski trail in Vermont”, and on skis, it certainly made for a challenging climb, and a fun, fast, and yes, slightly out of control descent. After a few longer runs in the previous weeks, I thought it would be fun to try and haul my early season body up Romance Mountain from the Ripton side. So, on a very cloudy and threatening Saturday afternoon, I parked my car at my favorite trail head on Brooks Road,the dirt road between Breadloaf and the Snow Bowl (for new readers). This trailhead never ceases to amuse me – there are two great directions to go – up Brooks Road past the Forest Service Gate, or out on the Widow’s Clearing Trail, and then a seemingly infinite number of “loop” or “out and back” runs to be tried as the two major trails branch out and interconnect. 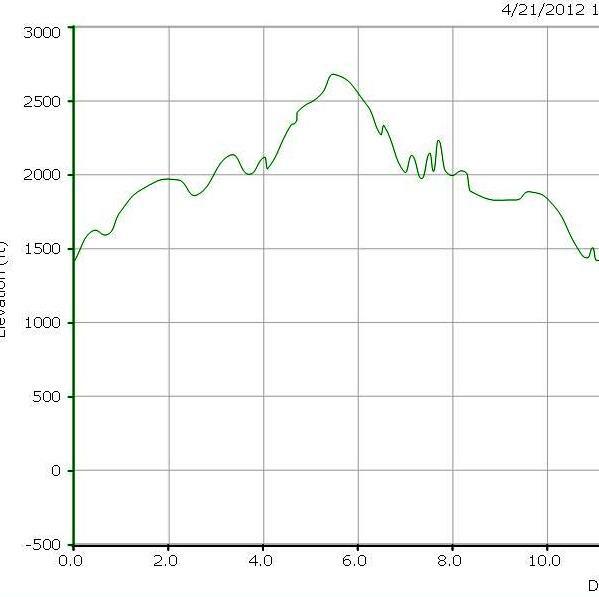 On this run, I chose the former, opting for the pretty serious climbing to be had along Brooks Road and trails beyond. As a curious aside, when googling this poem to get the words right, I discovered that it “embodies the ambiguous balance between paradisiac good and the paradoxically more fruitful human good“. Oh…and I thought it was about leaves? If you look carefully in this photo, you will also see some of the first springtime ephemerals, the flowers which appear and disappear as the season progresses. 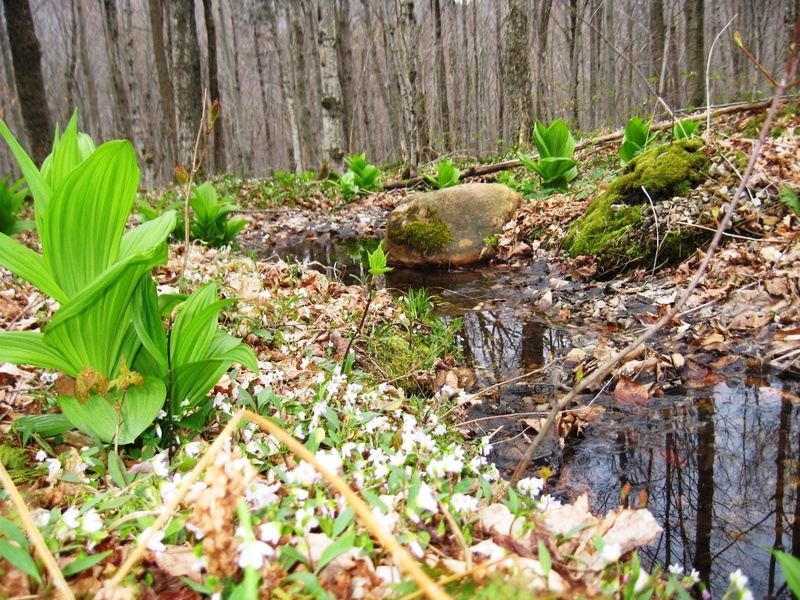 If I am reading the great posting on this topic by my fellow blogger Tim over at The Middlebury Landscape blog, the tiny flowers shown in this shot are known as “Spring Beauty”. 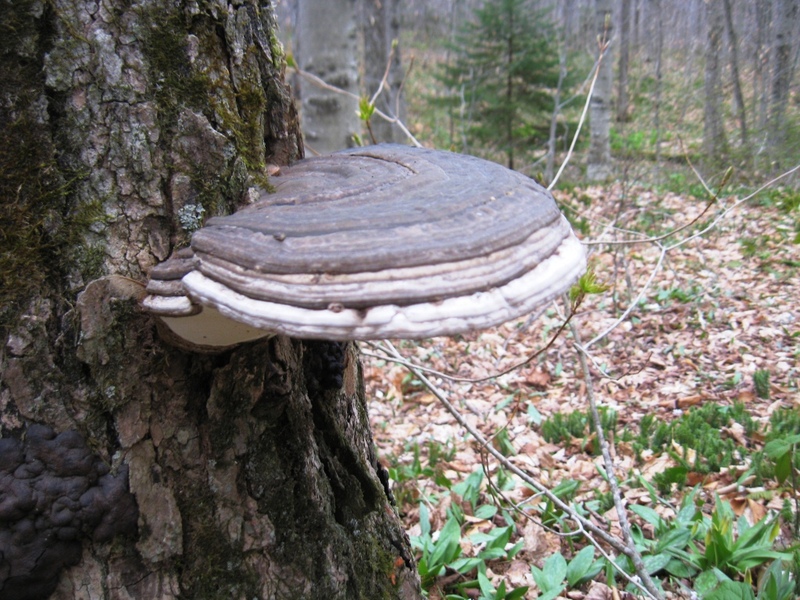 A little further up the dirt road, I also came across the following shelf fungus, which was so big it was almost scary. With a little careful cropping (and some imagination), it kind of looks like a duck bill, don’t you think? Eventually, after about 3.5 miles, Brooks Road came to an end, and I entered the true trail running segment. The first trail to the left provides a connection with the Long Trail, and it is described in another earlier post, when I ran up and over Worth Mountain and through the Snow Bowl from this side. Bypassing this turnoff, I came to a T, and a ski/mountain bike trail which forms part of the Blueberry Hill trail network. Now, I took the left, and this trail took me to the high point of the trail over the next 2 miles, in a series of gradual and sharper ascents. I briefly contemplated bushwacking to the true summit, but looking up, I realized it would involve getting my head stuck in the clouds, which were starting to envelope the highest altitudes. I took a moment to enjoy the limited view from my perspective. I also did a quick search up here for a small sign proclaiming it “Cindy’s Summit”, which used to grace the trail at this point, and was disappointed not to find it. Curious as to the story of the sign and its demise, I emailed Tony down at the Blueberry Hill Inn, who told me that he had placed the sign there after promising a frequent guest named (surprise!) Cindy that he would do so if she could ski all the way up there. Alas, new Forest Service regulations involving place names rendered this sign contraband, so he had to take it down. So much for poor Cindy’s immortality on Romance Mt! My return trip went much easier, of course, being almost entirely descent. The long promised colder weekend rains began just as I returned to my car, so I got lucky this time. This ended up as the most challenging run of the young ski season, with an 11 mile round trip distance, and about 1200 ft of climbing up to about 2700 ft- not bad for April! This entry was posted in Midd Blogosphere and tagged Blueberry Hill, Brooks Road trailhead, Forest Service, Hill Climb, Running, Worth Mountain on April 25, 2012 by Jeff. Stick season can be a tough time of the year for outdoor enthusiasts. As the last of the foliage is blown off the trees, the days get shorter and colder without the distraction offered by the ample snows of winter. While the occasional day with bright blue sky and crisp late fall air can offer a reprieve, it seems that cold rain and grey skies are more abundant than other seasons of the year. That said, a brief glimpse of acceptable weather over the weekend inspired me to seek out one last long mountain run to close out the trailrunning season, at least at higher elevations. Autumn yard chores, questionable weather, and other assorted responsibilities kept me busy until late afternoon, but I finally hit the trail at 3:30 pm, confident that there would be ample time to squeeze in a run before darkness set in on the last day before the end of daylight savings time. Once again, I sought out a new running variation from my favorite trailhead entry into the Moosalamoo Region, the Brooks Road Parking lot. In the course of one of my runs last year, entitled “Almost Like Running up Worth Mountain“, I attempted to summit Worth Mountain, the peak just south of the Middlebury College Snow Bowl from the north, passing through the Snow Bowl. Much to my bemusement upon completion of the run, I only realized after completion of the run that the high point which I had assumed was the Worth Mountain summit, was actually a subsidiary summit, and the true summit was a mile or so further south. I knew I had to get back to the actual summit at some point, and knowing that the summit could also be reached from the south on the Long Trail, I put this run on the “I have to try this in 2010″ mental list. Well, 2010 is fading fast, so this was my last opportunity to attempt this run. Once again, my entry to the mountains coincided with the climb of Brooks Rd. for the first segment of the run, but instead of veering to the west toward the Sugar Hill Reservoir, or the Sucker Brook Trail, I headed east at the dirt road’s terminus, taking the left spur trail leading to the Sucker Brook Shelter on the Long Trail. This connecting trail made for about a mile of pretty easy running until the last few hundred yards of ascent to the actual shelter. At this point, there was a healthy dusting of snow along the trail, but it was still easy to follow due to ample blue painted tree blazes, and the obvious indentation in the ground from the boots of countless hikers over the years. I am sure that this easily accessible shelter is heavily used during the summer months, but at this time of the year, there was no sign that it had seen any recent occupants. Immdediately beyond the shelter, the Long Trail proper was attained, and I headed left, planning to pass to the north over Worth Mt. to the Snow Bowl before returning to my car. A short way up the ridge I was treated to a limited westerly view, and realized that I had to maintain a decent pace in order to complete the run before sunset, but also knew that I would be fine as long as I got as far as the Snow Bowl before darkness, as the trailfinding from that point on would be pretty easy. Of course, the trail got pretty slippery with even the modest increases in altitude at this point, and the Long Trail is not exactly a runner’s superhighway. Routefinding in the fresh snow and diminishing light got a little tricky in a few places, but I was determined to keep this adventure from becoming a misadventure – the last thing I needed was a headline announcing “Local Trailrunner Found Frozen”, or worse still “Boneheaded Trailrunner Rescued”. These concerns aside, this was a gorgeous stretch of trail made even prettier by the inch or two of fresh wet snow which clung like lacework to the altitude-thinned trees. After a seemingly endless stretch of ups and downs I passed a lone backpacker heading south. I was comforted by the fact that he assured me that my guess that I had about a mile and a half to reach the top of the Snow Bowl was correct. I also knew he had further to go before sunset than I did, but he was probably smart enough to be carrying a headlamp. As expected, I hit the top of the Snow Bowl with just a few minutes to spare before darkness – definitely cutting it a little closer than I should have, though. An easy run down the Voter Trail brought me to the Snow Bowl parking lot under suboptimal lighting, but not before one last treat – a young bull moose greeted me as I rounded a corner on the lower stretchs of the trail. I was a little too close for comfort to have that good a view of him in the rapidly diminishing light, but fortunately he was not interested in this odd spectre dashing down the slopes, and he loped away in the opposite direction before I could snap his portrait. A short jog up and out of the Snow Bowl parking lot, and a little longer, but fast descent on paved road back to Brooks Rd. and my car brought the run to a close. Given the lateness of the hour and near total darkness, I attempted to call home to the undoubtedly justifiably concerned Mrs. Trailrunner, but the lack of any cell signal this high up on the mountainside prohibited this courtesy, so I hopped in the car and coasted home. This run covered a little less than 11 miles, much of it on rugged trail with slow going, and an altitude difference of 1800 vertical feet between the lowest and highest altitude, but probably a lot more climbing than that given the nature of the terrain. This made for a great way to wind down the running season, so bring on the snow! In case you find the maps in this blog difficult to view, or would just like to see the photography at a larger size, I recommend viewing the blog in the Mozilla Firefox browser, which allows you to right click (for PC’s at least, I am not lucky enough to have a Mac) on the illustration with the “Open Link in New Window” command for easy viewing. 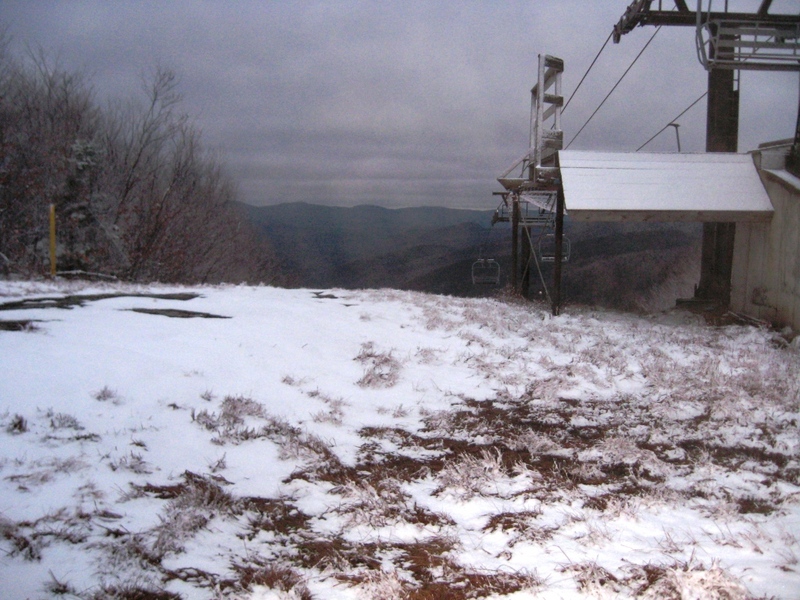 This entry was posted in Midd Blogosphere and tagged Brooks Road trailhead, Hill Climb, Middlebury College Snow Bowl, Running, Worth Mountain on November 10, 2010 by Jeff.